The planechase anthology had a MSRP of $150 I think but now its down to $90, I wonder if this one will sell for more considering Heavenly Inferno is currently selling for about $200 (although all the cards in it are about $120) or if it will do something similar. my guess is that it will just take longer for it to drop off. the big reason Inferno and all the season one decks cost soo much more is that they didn’t print nearly enough of them to start, so what this will end up doing is dropping the price for all the high dollar stuff in Kaalia’s deck by a bit. same, I was hoping for Zedruu or the ban list commanders. I’ve either traded them off or they were played by someone who, at the time, didn’t really care about card condition. They haven’t banned any of the commanders they have released for the commander decks themselves. why did they think hulk was a good idea to unban? 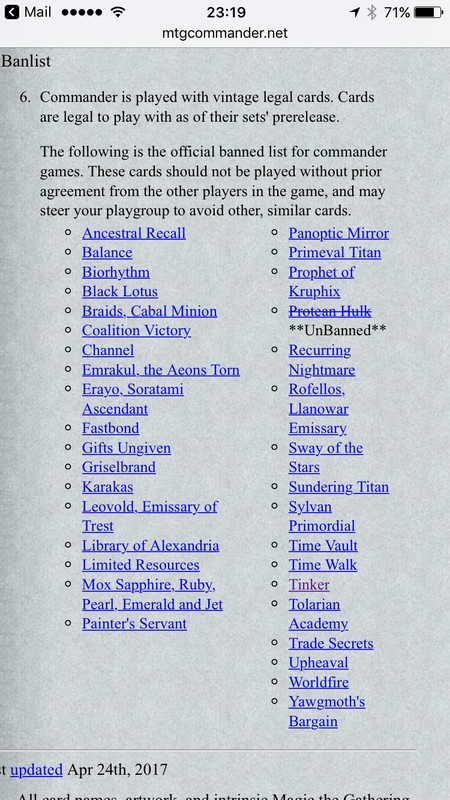 I have no idea, Inonly play commander chase and this is more or less the only ban list I keep up on. Why I don’t know though. cause he’s honestly not as scary as he used to be, sure Flash can make him a bit op but most of the time the board you fetch can be wiped pretty easly in edh, and with 40 life unless you fetched dorks to cast your commander you probably won’t be having that much damage stick to people. lets compare this to other stuff Flash can do, for example, Arcbound Overseer. now, modular 6 is already bad enough, I mean I just got +6/+6 on any creature I have, but then you have commanders like Animar, Daxos ,Shu Yun, and countless other aggro blue+ commanders can just beat you with that, heck Animar can then cast stuff like Wurmcoil for free after modular 6. … I know, but in edh the maximum number of creatures he can fetch is 21, and 5 of those die if you dont buff their toughness when they enter. Meanwhile the Animar player has a pro white pro black 7/7 that gets bigger every time they play a creature, and their creature spells cost 6 less right now so they can play a Magma Giant for rr and reset your board to just an 0/3 defender. I really don’t know why people have started treating me like I don’t know the game all of a sudden, but it’s starting to get annoying when people try to call me on stuff they don’t seem to understand themselves. hulk + blasting station = game. sac hulk to station get karmic guide + 1 cmc. then station untaps and you sac hulk again getting saffi + cmc 4. it is not about the number of creatures you get but the quality. I missed most of everything after Urzas Saga until Timoe Spiral and didn’t even know what the card did until a little bit ago, seems fairly easy to deal with though, exile this, exile that, drop Mycosynth Latrice and steal it from the library. Sometimes I wonder why they ban and unban what they do, then I remeber, I play sealed and kitchen table and there are actual competitive events for those formats. I can’t find this list you posted here. I Posted the official list from MTGEDH and this from Wizards website and none of theone here are listed, with the exception of Rofellos. Yawgmoth’s Bargain Respond with the link where those Dual-Commanders are so that I have that list as well. Thank You!! first of all I know the ban lists, so there isn’t a reason to post that, secondly, even I I somehow didn’t know it, somebody has already copy/pasted a picture of the ban lists. last of all it’s the dual commander rules, try looking those up. Found it, thanks. I posted the picture form the EDH site, then was on Wizards ACTUL site and find they now keep it on their site as well. My wife and I play nearly every night and I hadn’t realized they broke Commander down into two separate “formats”. If I had known of an alternate ban list, I wouldn’t have responded in the matter in which I did. Cut a guy some slack. Also, you meant duel commander vs dual commander, which is why I wasn’t finding the links. but, again, like I said, most of the value from the deck is due to wizards not running nearly enough of the OG commander decks, that cards that cost a lot for the decks aren’t the reprints but the cards that they made just for the decks. if you go through the deck list most everything that costs more than a two dollars are either commander staples, cards that see play in other formats, legends who get price padding since they can be generals, or cards that only have been printed in that deck. for example, Avatar of Slaughter. Honestly didn’t belong in the deck, isn’t a dragon, angel, or demon, and if it had been printed in standard there is no way a nonfoil would have broken a dollar. But thanks to it being in Kaalia’s deck it’s sitting up at over $3 without a foil. But is only because it hasn’t been reprinted. Most of the Commander only cards are way cheaper. The vast majority of cards don’t even hit 5$. I wish wizards would have kept their printing platform from the first set, vs a knee jerk reaction with the second that has kept through the other sets. Or at least came up with a middle ground. Instead they over print them. They certainly over printed two years ago, but last years were fine. I remember still seeing c15 at big box stores well into 2016, but c16 is gone from big box stores. Sure LGS’s might have them in stock, but they sold much better than the year before. A lot of vendors take to putting the product somewhere else. Some have gone to putting them into boxes with other decks and selling them together. Can still find them around here, SoCal, well it took some guy weeks to get his hands on Attaxa, but between the 3 Targets and 4 walmarts within 10 miles of each other, they’re relatively accessible here for now. all they want to do is sell product, and with stuff like Commander where they make super powerful cards that often times will even effect eternal formats, so as long as they will be selling a bunch of product, they’ll be printing as much as they can. sure they wont be hitting high resale but wizards doesn’t really care, it’s not their market. and with resale prices being lower that means cards like Sol Ring or Skullclamp now have reasonable price options for causal formats. Meanwhile a player seeing a deck with sol ring and skullclamp and all the other good cards along with a Commander and other cards that already add up to the price tag and they will think it’s a good deal. I’m not overly worried about re-sale. All product I buy gets opened sleeved and put the rest in waterproofed boxes to protect them in the event of water. I need to get the whole thing insured. I know wizards is in the business of making money, it just seemed a little more enticing with a slightly smaller print run, but that’s just me. Or any foil Commander at this time, since last year was the first year they dropped them at foil. This is annoying because it only has a fifth of the decks. Honestly I’d much prefer if we just got reprints of the 2011 ones and ignored the other years for now. I already have all the decks… but just those life counters (and being a premium product) i will be getting this. Note for anyone wondering: I almost exclusively buy premium product. Yeah, i already have some pre ordered. I don’t open premium product i buy. So if you only buy premium product… And you don’t open it… How do you play Magic? And why do you waste money on useless boxes? They gain value better than other products. And it’s an ego booster. How many people do you know purchased Commander’s Arsenal when it was released? I rarely buy singles, and boosters i open are usually prize packs. Now I’m curious… do you expand your actual play collection much then? It sounds like you don’t really buy cards to play with, mostly as collectibles you don’t open. Maybe I missed something. I collect the premium product. Not even as a investment thing, i’m just obsessed with it being special cards. But you are right, i don’t buy packs or singles very often. Cant complain they literally did the most popular deck from each cycle. How was the green the most popular? cause her deck still costs the most. right now she’s sitting at ~$12.50, which is putting her around $7-10 ahead of the other lists. money equals popularity in Wizard’s eyes so we get her again, instead of the deck with Goblin Welder, Wurmcoil, Caged Sun and Solemn Simulacrum to boot. Or Wizards could just look at sales figures of the Commander products and see which is selling the most. Freyalise is an extremely popular Commander in general, and her deck sold very well. Demand for her is high, hence the higher price than Daretti, Ob Nixilis, or Nahiri. Her and Teferi are far and away the most popular C14 products. Daretti is objectively the “best” general from the C14 decks, however to optimize his deck requires an immense investment, whereas optimizing Freyalise and Teferi is far less financially crippling. m8 people paid $40 just for her when the decks came out, the rest of the deck, outside of Titania and Song of the Dryads the deck was completly worthless. If wizards had printed a mono green elf that wasn’t just a lord by another name at any point in the last 3 years her price would have dropped immensely. heck, if they gave us just Imperious Perfect, but knocked it’s cost up g and stapled legendary to it Freyalise would already have dropped $10 off her price tag. all elves want is a mono green commander that can make them more elves, they’ll even put up with it being a 5 mana pw that dies to bolt as long as it gives them board. I said the demand for her was high, not her deck. Her deck was by far the most popular, and this is how you get a reprint to lower prices due to current low supply. “According to EDHREC, Freyalise was the fourth most popular (second to last) of the planeswalkers as a commander, but she was the third most popular as a card in the 99.
so, unless I don’t understand how placements work, she is not only not the most popular, but she’s almost the least popular of all 5. now this could be due to the fact that edhrec lists different decks, and most of the time if you are building elves there isn’t as much wiggle room for it like red tinker or true blue control or white equipment have. Literally, the only reason her deck is getting reprinted is cause it costs the most, not cause it’s the fan favorite. Objectively? Oh, zombie. You never learn. Assuming completely tuned deck lists, Daretti is the single best general of the C14 releases, and his signature tag-along spell, Scrap Mastery, can outright win games by turn 4 consistently. It comes mostly from the archetype that he enables, and that’s blisteringly fast and linear Red/Brown Combo. Even tuned, the other generals just can’t compete. Daretti is just too strong of a value engine, and he makes his threats far too hard to permanently answer consistently. Either you get ground down by Daretti himself, or the player drops a Scrap Mastery after tutoring a Mycosynth Lattice and you’re left to scoop it up with no permanents in play to actually scoop up. Not to mention Daretti Combo is an immensely strong deck outside of the C14 vacuum. In my local EDH league, the only general I’ve played that I’ve yet to surpass with my 20W-5L league record with Breya is Daretti, who sits at 24W-1L. The only loss came from Azusa. But it was fully foiled so I enjoyed the beating while it happened. Yes, but none of your arguments have the least bit of relevance when determining the “best” general in a non-competitive format. Nobody cares about which general allows you to win more, or more consistently. Nobody who actually plays Commander, that is. Sorry, but competitive commander is a thing. You sound like the sort of person who’d like to pretend that’s not true rather than the sort who just doesn’t know, but competitive EDH is very much a thing and it’s totally possible for one general to be better. Not that I’m advocating for Zombie’s intelligence, of course, I still remember that Sin Prodder argument. “Competitive commander” is an oximoron. People who created the format did so SPECIFICALLY to have a strictly non-competitive format. People use the same ruleset to play competitively, I know that, but it should be crystal clear that is NOT commander in any shape or form. It exists, but it’s something else entirely. So no, there are no “better” generals in commander. Wizards only sells the Commander sets as 5 piece master cases, one of each deck. So they don’t have the sales data of the individual decks. Wizards sells 5-deck bundles to LGS’s, yes. Obviously. Did I say they would be looking at that? I said sales figures, obviously implying those for the specific decks. They can easily crowdsource the information they need from retailers, both physical and online. Source: I’m a person with common sense. I am going to have to ask where you got those numbers because they are way too low. well, mtgGoldfish still has their page for the decks, and all of them are on their deck/card price listing thing. I dunno, I’d say that Freya was possibly the least popular out of 14, only reason to get her deck was that she is $10-15 cause other mono green elf legends are kinda just bland lords, but the deck is filled with cards that even at the time there were better versions of. I mean the deck has Seer’s Sundial in it. the only deck that should be in belongs to an 8 mana Iron Golem. According to EDHREC, Freyalise was the fourth most popular (second to last) of the planeswalkers as a commander, but she was the third most popular as a card in the 99. As I recall it, White was the hardest to get deck by far, followed by red, then green. Black and Blue were both pretty easy to come by in a Walmart or Target. Didn’t realize that Freyalise was that popular. It was the eyepatch, put her miles ahead of the competition that year. Yes but they have never been considered a black race, and any elf-centric deck will almost never be black or significantly black. actually I’m pretty sure she sold the least, I remember an article that daretti ,nahiri and teferi outsold ob and freya so hard that the second run didn’t have green and black in it. the only reason she costs so much in comparison now is that she doesn’t have nearly as many copies floating around. which is why Wizards chose her, her deck costs the most now. If you need more proof Daretti actually sees(or at least saw) eternal play, so he had the most printings and even got reprinted in c16, which is why he now costs $2. Buy the spinners on ebay. I really want the Heavenly Inferno Deck. Is it legal to play this version of the deck in an actual EDH Magic sanctioned event? I mean the cards will all be in deck sleeves… Or do i need to build this deck using official magic cards. These *are* official Magic cards. There’s nothing special about them, you can play them anywhere. What he said, magic no longer releases cards that can’t be used in what formats they are built for. That’s why they stopped making the Championship decks with the special backs. Does anyone know what the MSRP will be? My local shop sells them at MSRP till they run out. But I have read anywhere between $50-$190 and he didn’t know last time i called. MSRP: 164.99 USD ~ from the mothership product page. Damn that’s still pretty high, but i guess it is worth it considering Kallia alone is worth almost $50.But since he sells at MSRP i can still save $30 compared to buying at the other local shop. Thanks for the info i can prepare for the dent my paycheck will take from this. lol. Yes, they recently had an article saying that the front commander will be foiled. Sorry not interested, already got all four of these when they came out, and not so interested in getting duplicates of these specific four. Plunder the Graves is the only one of these decks I did not get and one of the few I did not get because I was low on money. I am not buying three decks I already have for one I don’t. Maybe I could find that one deck at Walmart or target. Yeah, Wizards should’ve called you and found out what decks you already have to avoid this problem. Yeah I mean it’s not like anyone actually posts offhand comments about their interest or lack thereof in products without expecting to be personally catered to. I hope that token box in the middle is much bigger than it looks, cause It’d be disappointing to have to store everything for four of my casual edh decks in more than this container. it looks the size of one of those that comes with a Fat Pack, and that’s not even half of what I need for my Rhys deck. Given these are commander decks, I think the casing goes deeper into the back, enough to fit a non-small amount of tokens. Also, the whole product comes in that box, so I certainly hope tokens fit in there. Sadly, they’ll likely only fit while unsleeved. well, like I said it looks like the box is about the size of their 1 inch boxes. that isn’t going to fit all the tokens for a casual Rhys deck, I use the box that came with Mimeoplasm’s deck right now and I still run out of saplings or elves every now and then, and i’ve got like 25-30 of each. the worst part is that it looks like the spinners lock it in, so you would have to take them out to put a bigger box in, and they are why I want the box! welp seen it now, that middle part doesnt hold tokens at all, it’s a blurb about each commander. but the boxes for each deck are big enough to fit a sleeved deck and the 20 tokens each deck comes with. Wait really? Enough individual box space for a Fully Sleeved commander deck plus 20 tokens in the individual boxes? No fooling? Non-cardboard boxes with room for full sleeves plus tokens… They at whichever part of WotC finally upped their game. To them who made that happen in any way: Thank you. I does make sense though, cause there are two people who are going to get this, one will be the collectors who if they even take the plastic wrapping of the anthology is a surprise, or the people who actually wanted the decks and stuff, so giving them 4 commander sized deck boxes is great. I kinda want it, but 160 is a bit too steep for my bank account right now. My LGS did it for 140. A lot of them seem to be discounting it. you can probably sell of the parts of each deck for a pretty penny, Freyalise is a $12.50 commander only card and this will be her first time foiled, actually all the commanders but Kaalia are getting their first foil here, Meren has gone as low as 6th most viewed on edhrec since she came out so her foil will probably also fetch a a good amount in a month or two. I would basically count this as Kaalia’s first foiling as her last one was an extremely limited supply in commanders Arsenal. Video of the product. In case anyone wanted to now what you’re paying for. The deck boxes look much better than any deck box WotC has ever given us in the product itself. Borrowing 100,000 Arrows. It’s just a typo.